Branding is the action of creating or defining your brand. Once you complete that process, usually in about 5-10 weeks, your business shouldn’t have to do branding again for another 20 years. If you change your name or primary focus, then you might do it sooner. There is a ton of confusion about what exactly branding is. Posts appear on the interwebs all the time that confuse the issue. Many graphic designers have no idea what branding is, nor how to do it effectively, yet people rely on them to know. Even authors get it wrong sometimes. An Entrepreneur magazine post titled The Basics of Branding doesn’t actually refer to the basics of branding at all. Right at the start, the author asks what ‘branding’ means, but then defines ‘brand’ instead. He defines some of the basics of a brand, but some of the development questions refer to things one would consider in developing a marketing plan, which is wholly different. The confusion surrounding brands, branding, and marketing is quite common. People even confuse branding and advertising, which are completely different processes, each critical success steps in their own right. 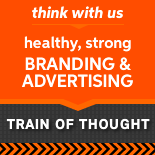 Read about the differences between brands and branding in another post on Train of Thought.